If Cut the Rope: Experiments uncovers one scientific truth, it’s this: ZeptoLab knows how to put together a charming puzzle game. Loyal rope slashers are undoubtedly pleased to see the iPhone classic back on the ropes again in all its candy eating glory. The physics engine still dominates, the graphics are still Pixar-appealing, and everything everyone loved about Cut the Rope initially remains intact with a few small additions. Headed by the beloved Om Nom monster and an ever encouraging mad scientist, this brand new installation of Cut the Rope packs 75 levels into three cut the rope worlds with the promise of more levels to come. The strategic rope-cutting fun of Experiments starts with the introduction of the new mad scientist, who, despite the mad scientist stigma, is actually your biggest fan throughout the game. The Getting Started level pack offers reminders of the old floating bubbles and puffing air cushions, but as soon as the mad scientist starts to compare your work to that of a Nobel Prize winner, the new features are well on their way. 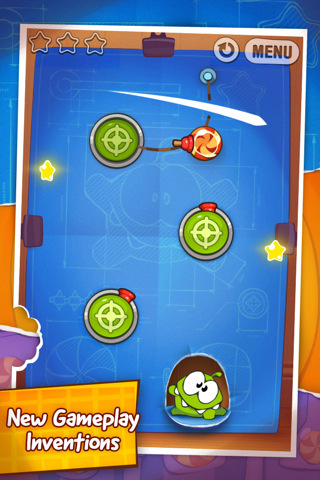 For starters, Cut the Rope: Experiments introduces trampoline-like bounce pads and then they hit you with suction cup dart ropes and rope holders that sticks and unsticks to the level background like a reliable shower caddy suction cup. 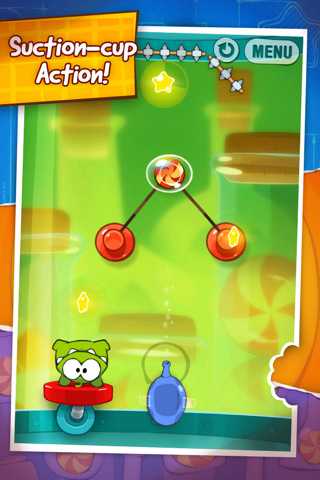 These new additions add some new dynamic gameplay to the mix without departing from the original Cut the Rope feel. ZeptoLab also threw in a few new adorable Om Nom animations and a new soundtrack to boot along with a few clever Tolstoy and cookie science book style additions etched into the backgrounds on the path to completion. Cut the Rope: Experiments’ newest addition is a hidden photo mystery embedded throughout the levels (and one that gets uncovered with a Facebook Like). 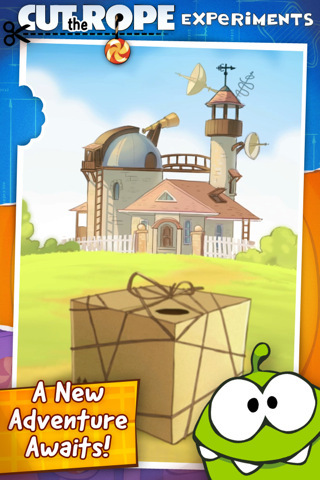 Each found photo reveals hidden evidence for the Mad Scientist’s cinematic story, offering a nice addition for Cut the Rope addicts without selling out or cutting into the original dynamic. 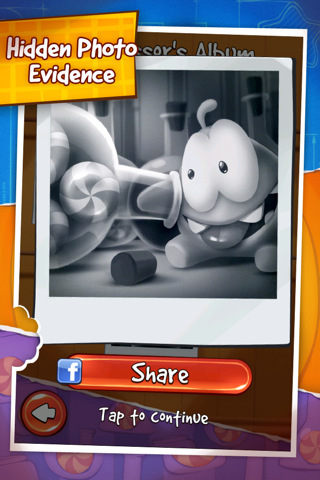 All in all Cut the Rope: Experiments is a solid win that’s well worth the buck. 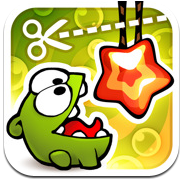 Bottom Line: Cut the Rope: Experiments stays true to everything gamers love about the puzzle series. Expect everything you got from the original game, plus a few (somewhat minor) twists.